Navy Arctic Submarine Laboratory and APLIS have set up their ice camp near Purdhoe Bay1 in support of navy submarines2, submariners, and Arctic researchers, collectively referred to as ICEX 2011. Use first year ice for jerry-rigged showers; just kidding, there are no showers. Use second year ice for jerry-rigged cooking; refer to instructions on "therma pouch". Use third year ice3 for jerry-rigged coffee; ok, so it's not Starbucks. Remember that "hot-bunking" has a slightly different meaning in the Arctic. Return to submarine as soon as possible; tell crewmates sea stories about the "beautiful Arctic"—after a hot shower, meal and coffee. UPDATED 03/19/2016 DMDA, Massive US Submarines Breaking Through Ocean of Ice in the Arctic (video includes some beautiful underneath ice shots of deployed dives) and Navy, video gallery, Hartford breaking through Arctic ice and ICEX 2016, airdropping Camp Sargo pics. Los Angeles-class submarine USS Hartford (SSN 768) breaks through Arctic ice, during ICEX 2016, stressing its retrofitted sail after the 2009 sail-bending collision with the surface ship USS New Orleans. UPDATED 06/09/2012 Submarine Short of below decks on Seawolf-class, Connecticut SSN 22; cropped snap shots include sail ladder; aft ops and pilot station; wide torpedo room; and mess (below). Thermal steric expansion of oceans (i.e. 0-700m and deep ocean) and polar ice melt runoff (terrestrial water mass relocated to ocean) are two major contributors to sea level rise—both are related to global warming (natural and anthropomorphic). Reconciling various data sets and models is an important and challenging task. The Newton site may be useful to students with Arctic questions—also there is a searchable database of archived questions. UPDATED 12/04/2011 NOAA, Arctic Report Card 2011 and NOAA, Arctic Report Card 2011 Highlights and YouTube, Arctic Report Card 2011 Video and NOAA ClimateWatch, Old Ice Becoming Rare in Arctic (Time Lapse Video of multi-year ice gyre - 1987-2010 - notice the amount of black beginning 2007). Our fast changing Arctic presents our submariners, submarine platforms, and supporting scientists with significant challenges in the areas of: communication; navigation; ASW; acoustics; sea-ice-atmosphere interfaces, predictive model building-modification; and learning-training. NASA, Aquarius satellite focused on measuring sea surface salinity. The National Snow and Ice Data Center. The annual Arctic 2011 ice coverage equals the 2006 minimum maximum. NAP, National Security Implications of Climate Change for U.S. Naval Forces. IPCC, Fourth Assessment Report: Climate Change 2007 (AR4). NSF, Ultraviolet (UV) Monitoring Network. NSF, Cooperative Arctic Data and Information Service (CADIS). Irradiance Measurement and Instrumentation Data Center (MIDC). Primarily Colorado, Utah, Nevada, California and Arizona stations. NREL, Solar Radiation Research Laboratory (BMS; Customized Current Conditions Display - non-graphic, updated every 60 secs. NREL, Renewable Resource Data Center (RReDC). Env Canada, Canadian Ice Service. AAAS, Recent Warming Reverses Long-Term Arctic Cooling. GRL, Decline in Arctic sea ice thickness from submarine and ICESat records: 1958–2008. Recently declassified US submarine sonar measurements of Arctic ice thickness has enable researchers to update and extend the data set (historic submarine sonar combined with recent ICESat data). The overall mean winter ice thickness has decline an astonishing 1.75 m since 1980 (3.64 m in 1980 to 1.89 m in 2008)! Alaska Dispatch, Arctic Ocean grows 20 percent fresher, but don't flee Manhattan yet. Short discussion with interesting research links (Arctic layer mean salinity change). Public data coming out of this year ICEX 2014 (and "Ice Camp Nautilus") are non-substantive, uninteresting and uninformative. Perhaps, this reflects a hasty last minute decision to conduct an ICEX in response to President Putin’s latest "shirt removing" charade (annex Crimea)? Officially, ICEX 2014 was scheduled before his charade—hopefully he'll put his shirt back on before he catches a cold. In short, Arctic ice floes are melting fast and our navy wants to just as speedily switch from Arctic asset "window shopping" to a "layaway plan". 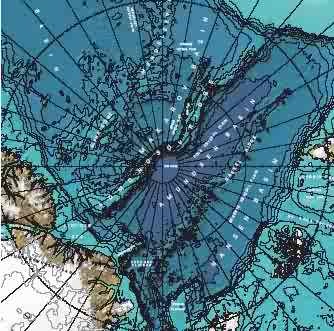 Much more definition, detail and debate must precede any navy Arctic asset "layaway plan". 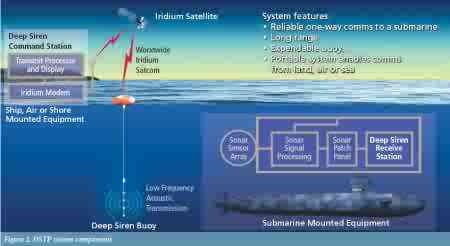 A quick status of submerged submarine communications—communications at speed and depth is out (i.e. too expensive and uni-functional), multi-functional autonomous vehicles and network nodes are in. UPDATED 10/13/2011 AWI, Young and thin instead of old and bulky and Nature, Scientific challenges in the Arctic: Open water (also, Nature Special, After the Ice). Researchers have collected Arctic ice thickness data for the summer 2011 for comparison with 2007 ice thickness data. CNN, 'Ice Wars' heating up the Arctic. NavyTimes, Sub surfaces after oxygen generator fails. Fuel Cell Nation, Hamilton Sundstrand's ILPE - Oops!. Reuters, Exclusive:U.S. submarines show force amid race for Arctic riches. Reuters, Raytheon seeks ways to help submarines stay in touch. Virginia-class USS New Hampshire (SSN 778) uses Deep Siren Tactical Paging (two one-way communications), developed under the navy's Communications at Speed and Depth Program to evacuate a submariner with appendicitis. The Arctic's mean sea surface temperature can quickly immobilize and kill an uninsulated immersed human. Hence three divers wearing black insulation suits standby to rescue anybody unlucky enough to fall in (Reuters Photo/Lucas Jackson). 1. Purdhoe Bay (70°19′32″N 148°42′41″W) is above the Arctic Circle (66° 33′ 44″) at the end of the Dalton Highway , about 314 km South East of Barrow, Alaska. 2. 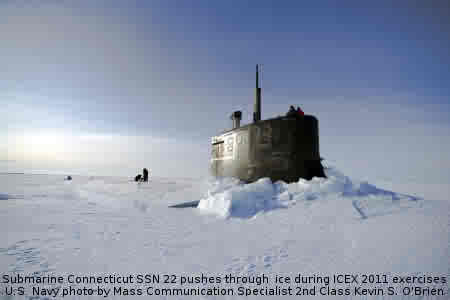 Virginia-class USS New Hampshire (SSN 778) and Seawolf-class USS Connecticut (SSN 22) have been designated for the ICEX 2011 exercises. UPDATED 10/23/2011 Notwithstanding Virginia-class images its structures and systems are not currently capable or optimally configured for extended autonomous under-ice Arctic operations. Some have recommended that these deficiencies be remedied, at least for some current VCS platforms. The significant costs associated with these recommendations will likely delay implementation until later VCS blocks or follow-on VCS-improved platforms. Until then current VCS platforms will likely utilize specialized ad hoc ice-packages for limited operations in higher northern under-ice latitudes. 3. Arctic submariners will immediately understand that an Arctic sea ice salinity gradient impacts more than their shower, meal, and coffee. The salinity of Arctic sea ice changes with the ice's age. As older and less salinated Arctic ice melts it changes the ocean salinity—dramatically impacting a submarine's hearing, maneuvering, and tactics. Climate researchers have a global interest in the thermohaline cycle—how it impacts on global temperatures. UPDATED January 10, 2011 Those wanting a general undergraduate level understanding of the carbon cycle and the oceans' role in modulating climate may enjoy the David Archer's global warming video lectures and related textbook.